The Tom Ticher Junior Cup is returning to Galway once more as Calasanctius College netted late in proceedings to take the title with a smashing goal from the talented Ronan Manning, proving the decisive bullet in Athlone IT this afternoon. Captain fantastic Aaron Connolly put his side in front in the early exchanges as a quick throw in from Jim Crowley found the head of Connolly. His back flick deceived McGrane between the posts to give Oranmore a slight advantage. Coláiste Phádraig were awarded a corner midway through the first half and Paul Cleary delivered a delightful ball into space. Josh Hogan rose highest and headed home in fine style. This equalizer ensured it was a lively encounter with all to play for. It was end to end stuff as Oranmore absorbed most of the sustained pressure. Yasser Mahrouk and Jimmy Mwanga tested the versatile goalkeeper Mark Greaney but the young Galway man was relishing the occasion and time after time denied the Lucan talisman. Connolly was proving problematic for the Lucan lads but some sterling defending by Captain Conor McGuire, Cleary and Smith ensured the deadlock remained. Manning and Quinlivan craved out some excellent football but their attempts on target didn’t trouble Cian McGrane too much. There were dramatic scenes for Calasanctius as Nathan Lynskey cleared off the line following a thumping thunderbolt from Ross Strong on 24 minutes in a crowded goalmouth. Three minutes later and Yasser Mahrouk had another great chance palmed away from the impressive Greaney. First minutes into the restart and again it was the lively target man Mahrouk who missed a gilt edged opportunity to put Lucan ahead. Oranmore responded with shots from Connolly and Smyth but neither fell on target. The duo were enjoying a spell of fine football but the end product was lacking some real conviction. Greaney pulled off a stunning block from Jimmy Mwanga on the hour mark to deny Coláiste Phádraig any progression in the game. It had all the signs of additional time as the clock ticked down but with only 2 minutes of normal time left, up popped the hard working Ronan Manning to score a peach of a goal to prove the match winner. St. Joseph’s College, Galway were winners last season, now it was the turn of near neighbours Calasanctius College, Oranmore to take the Cup back West. 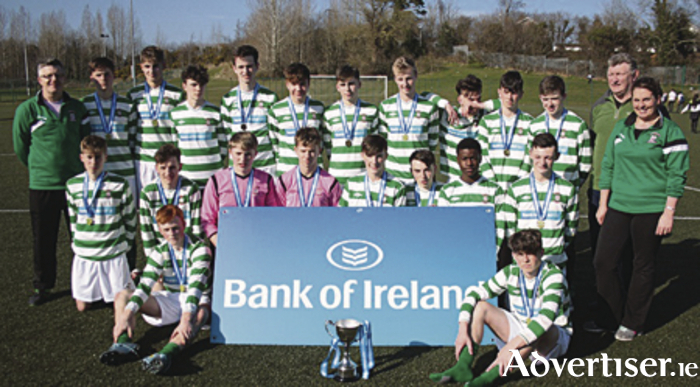 This is the second All Ireland title for Ruth Broderick’s troops as they captured the Minor Cup last season. Will it be a Senior title in 2017 for the Oranmore lads? Only time will tell. CALASANCTIUS COLLEGE, ORANMORE: Mark Greaney, Cillian Doyle, Jim Crowley, Nathan Lynskey, Adam Rooney, Eoghan McDonagh, Josh Quinlivan, David Price, Aaron Connolly (Captain ), Ronan Manning, Luke Smyth. TEACHER: Ruth Broderick COACHES: Noel Greaney, Mark Smyth. TEACHERS: Billy Rafter, Daniel Tarpey.